Effectively dissolves sealant, paint, tar or bitumen, rubber and chewing gum on pavers, slabs, concrete and masonry. Dibasic-ester-based, it works and evaporates slowly, making stripping of large surfaces much easier, especially when the ground is hot. Its emulsifying additives make it easy to rinse with a pressure washer. Wear adequate protective clothing. To ensure the results will meet your expectations, it is advisable to test the product on a small hidden area. 1) Surface should, ideally, be warm to the touch (morning). 3) Let work for 5 to 10 minutes. 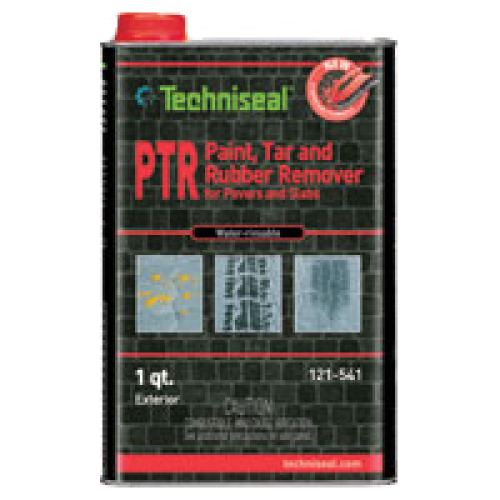 Note: This product dissolves any sealant; apply a new coat of sealant on stripped surface. Product must be kept in its original, unopened and tightly sealed container and stored in a dry and well ventilated place with controlled temperature (40°F to 75°F). Keep sheltered from weather and direct sunlight. Properly stored, the products shelf life is 3 years following production (see date on packaging).